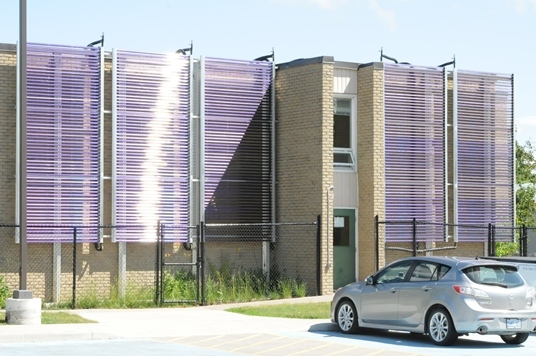 Installed over a period between November 2010 and March 2011, solar thermal installations at Oxford County’s Social Housing Complexes in Woodstock (Pavey St.) and Drumbo have now been up and running smoothly for six years. 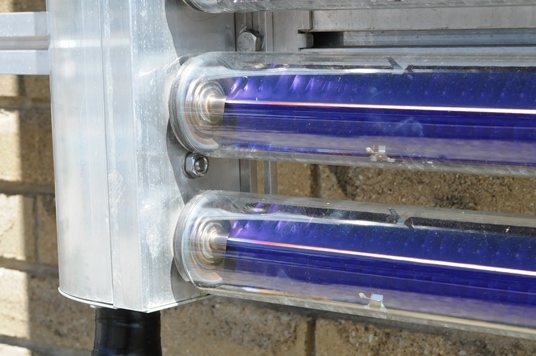 These innovative solar thermal systems use tubes to pump freeze-protected fluid through the building’s heat systems. Solar heat is generated by a solar collector and as the fluid passes by the collector, it warms and is then pumped to the building’s water heater and heating system. After reviewing the results after the first five months in operation, the solar thermal system lowered the buildings’ gas bills by over 17%. (Natural Gas is the fuel source used to both heat the building and the water.) These systems produce a heat that is equivalent to a mid-sized gas boiler. The systems are not only leading to savings on gas bills, but they are carbon-free, which is a 100% improvement from the natural gas heating boiler. These solar thermal systems were engineered and constructed by Enerworks Solar Heating and Cooling in Woodstock. As long as the opportunities continue to present themselves, Enerworks will continue to implement these systems into buildings, residential, agricultural and commercial. Since installing these two systems, Enerworks has created a remote monitoring system. They can now assist with troubleshooting for any project by smart phone or computer, no matter where they are located. The residents and owners of these two social housing complexes are enjoying the building’s heat and hot water at a lower cost and environmental footprint, thanks to the innovative solar thermal heating systems. This electrified trailer is a small scale example of how sustainable energy technologies can all tie in together to show off some of the capabilities of emerging technology. The roof of the Sustainable Energy Expo (SEE) Trailer is equipped with a 1.5 kilowatt solar photovoltaic system. Energy harvested by the solar cells can then be stored in the energy storage unit – 16 batteries with a total energy capacity of 5 kilowatt hours. 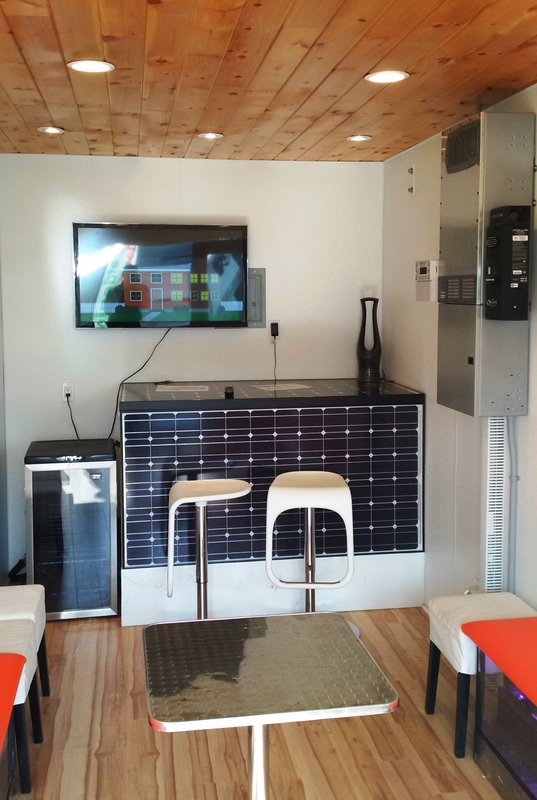 The SEE trailer is also equipped with an Outback Radian charger/inverter and solar charge controller which allow the trailer flexibility to draw energy from the power grid, or rely on its own power drawn and stored from the solar cells. So what do these components power within the trailer? The comforts of home, of course. Since the trailer is taken around to various public events for display purposes, it contains a refrigerator and coffee maker to serve drinks to those who venture inside to check it out. While they enjoy their beverage, they can watch an LCD television that plays videos to learn more about energy conservation and smart technologies. As well, the SEE trailer is equipped with high efficiency LED lighting to view some of the other educational displays in the trailer. If you see the Sustainable Energy Expo trailer at an event in Oxford County, have a look inside and feel free to ask questions. It’s all a part of discovering what is now possible when it comes to renewable, sustainable energy! When it was unveiled in April 2012, the Oxford Gardens solar thermal installation was the largest of its kind in North America. This innovative solar thermal system not only provides heat for the retirement home’s pool and domestic hot water needs, but it also powers the air conditioning unit (a 30 ton absorption chiller) to keep the building cool during the warmer months. Overseeing the project was Woodstock-based Enerworks Inc. with German solar technology provided by S-Power and NARVA. 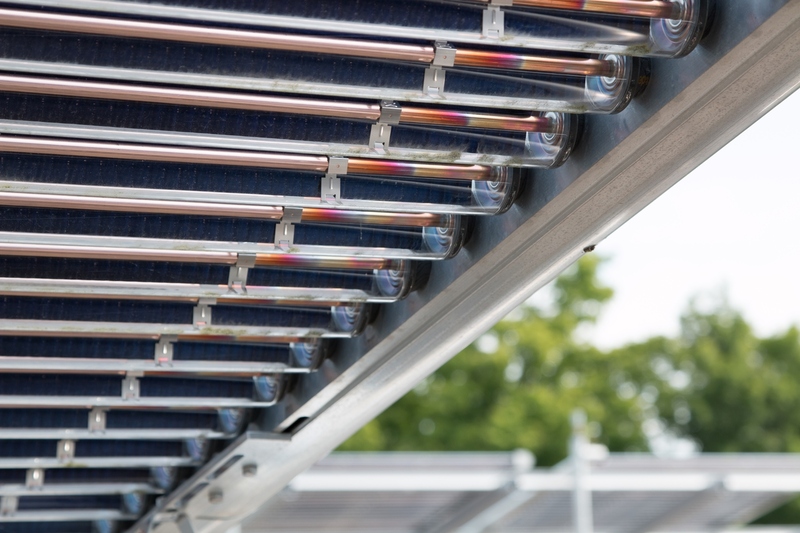 Three solar power collectors are fed by over 3200 evacuated glass tubes, covering much of the 560 square meters of roof space at Oxford Gardens. The solar thermal system powers about 40% of the building’s air conditioning load, saving over 100,000 KW hours of peak electricity during the summer season. With the system also heating water, a natural gas reduction of 50% is being realized in the summer months, while simultaneously powering the air conditioning unit. During the cold weather season, there are days where the heating system does not come on until the evening, as the system collects and stores solar energy. The 200-plus residents of the retirement home are able to enjoy a heated pool, a hot cup of tea, and even air conditioning, thanks to innovative engineering and the harnessed power of the sun. Cow manure produced at Greenholm Farms near Embro is helping to power 200 homes in Oxford County. Father and son farm owners, Gord and Dave Green began producing electricity with their biogas plant operation on January 18, 2013. Manure produced by the farm’s cows, along with other organic waste, is loaded into an “Anaerobic Digester” which breaks down the manure over a 30-40 day period. Methane gas which is used to power a generator, producing 250 KW of continuous electricity which is fed back onto the grid, and purchased by Hydro One on a FIT contract. A “digestate” rich in nitrogen, phosphorous and potassium, comparable to a peat moss, that can be used as compost material, or for bedding under dairy cows. The other innovative thing happening at Greenholm Farms, is that heat is being captured from the Anaerobic Digester and is used to heat the digester, while providing hot water heat for the barn, farmhouse and shop on the property. The Greens worked with PlanET Biogas Solutions from St. Catherine’s, Ontario to set up their digester system. 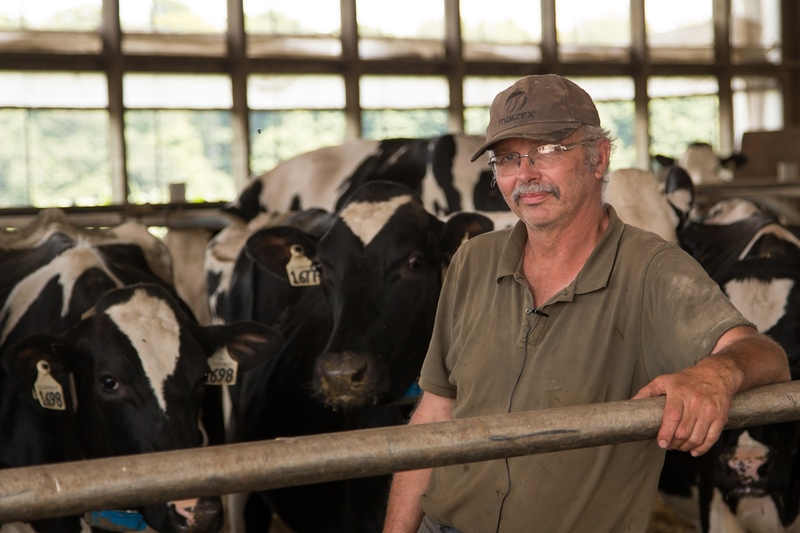 The Greenholm biogas plant is a remarkable evolution for a family farm: from dairy production with feed and cash crops to harvesting electricity produced from the very manure from the dairy barn. It’s a leading example of innovation and sustainability in Oxford County. For more information contact Greenholm Farms Ltd.